Welcome to Jackson Police Department.! Help your Jackson PD prevent crime and better protect our citizens. Leaving on vacation? Concerned about the neighborhood? Let us know! View city/department forms and ordinances here. Welcome to the Jackson Police Department website! Jackson Police is responsible for police services to the city twenty-four hours a day, seven days a week. 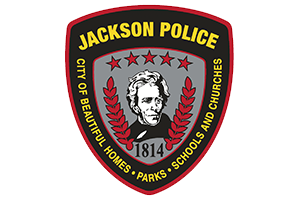 Jackson Police is also responsible for dispatching calls not only for police service, but calls for fire, medical, and 911 in the City of Jackson. We have adopted a service oriented philosophy which embodies principles of public service and citizen input in solving our communities problems. In addition to basic police services, the department provides community based services such as Neighborhood Watch, bicycle patrol, law and safety related education, and child safety seat instruction. Jackson Police Department is an Internationally Accredited Police Agency with The Commission on Accreditation for Law Enforcement Agencies, Inc., (CALEA®). If you should have any questions or concern please feel free to call us at (573) 243-3151 or in an emergency DIAL 9 1 1. "Dedicated to Serving and Protecting the Community of Jackson Missouri"